Congratulations! 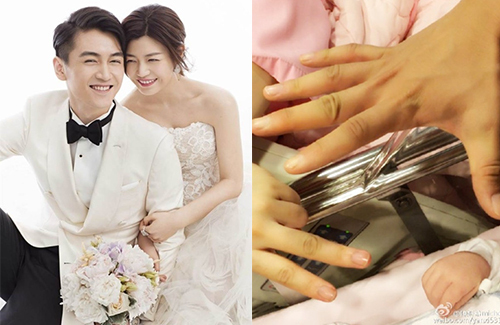 Taiwanese actress Michelle Chen (陳妍希), and her husband Chinese actor Chen Xiao (陳曉), announced on social media today that they have welcomed their first baby, a boy! 33-year-old Michelle and 29-year-old Chen Xiao started dating soon after collaborating in 2014’s The Romance of the Condor Heroes <神雕俠侶>. They tied the knot in July, when Michelle also announced that she was expecting her first child with Chen Xiao. On December 20, Michelle shared a photo of her newborn’s fist on Sina Weibo, announcing that she has safely given birth to her little boy on Monday. Michelle and Chen Xiao also stuck out their hands, in the fashion of rock, paper, scissors. Congratulations to the happy family!!!! I love the “Listen to your mother” remark from the hubby! Too cute! @dramas4me i hear you. My older one is not a teen yet but already a handful!! Still love then though! @happybi Hello. Happy Holidays to you. The fastest way to get gray hair is when your kids become teenagers. Of course we’ll always love our children even when they are driving us crazy. @dramas4me happy holidays to you too! I hsve a niece who is a teen so i know what you mean. Not looking forward to it! Thanks to my grandma good gene I still have a full ser of black hair. Can’t say the same for my hubby! luckily she endured that abusive online bullying because her role was not approved by those critics. well, between her life and the online bullying and still getting jobs, i think most people would still choose her life. Too bad no picture of their baby wish we can see it.